Regatta Sandals from Outdoor Look UK. 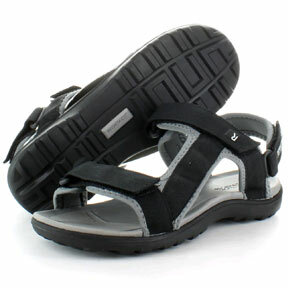 Buy walking and hiking sandals at discounted prices online today. Comfort sandals available for next day delivery. The Regatta Sandals cover a wide range of options, from a pair for that holiday around the pool to sandals designed for something a bit more vigorous. The Regatta Womens Seagrass Sandal is lightweight, but durable, with an anti-slip sole and water friendly footbed. It features a printed swirl pattern and a clear pattern specifically designed for the female foot, perfect for the beach and outdoor. The Regatta Ad-Flux Sandal, is spandex lined for extra comfort and has adjustable hook and loop straps as well as an adjustable back strap which is padded to ensure the correct fit. With its moulded instep and sole it all adds up to make this a performance sandal which is ideal for the beach and even rock-pooling as well as being perfect to use as everyday wear. The Regatta Sandals offer a great choice and with our superb customer service and free delivery options backing it up, in the free catalogue or on the website, this is a great product for the holidays.